Happy Taurus New Moon! This is the time in the lunar calendar when we turn to the world around us. Taurus, the first earth sign, is the fundamentals of life, what we need to flourish in our bodies as well as find a solid ground to build our lives upon. For that Taurus is food, money, resources, and the things we own. The new moon is exact on May 15, 2018 at 7:48 am EDT, 26 degrees Taurus. That’s 4:48 am Los Angeles, 12:48 pm London, and 9:48 pm in Sydney. Taurus Season is one of my favorite seasons. Perhaps I’m biased, but I love how it coincides with the world in bloom, a reminder of the fertility and abundance of the physical world. If you know a Taurus (or Taurus rising), it’s a sign that likes to graze, taste, accumulate, and enjoy life’s pleasures. In many ways this new moon is a time to connect with that beautiful energy — this root energy of creation. But here we are, right on the cusp of Uranus arriving in Taurus, a planet that will spend eight years shaking up everything we think we know about the sign of Taurus. This is an odd new moon. It precedes the arrival of Uranus in Taurus by a few hours and Mars’s entry into Aquarius by almost a day. 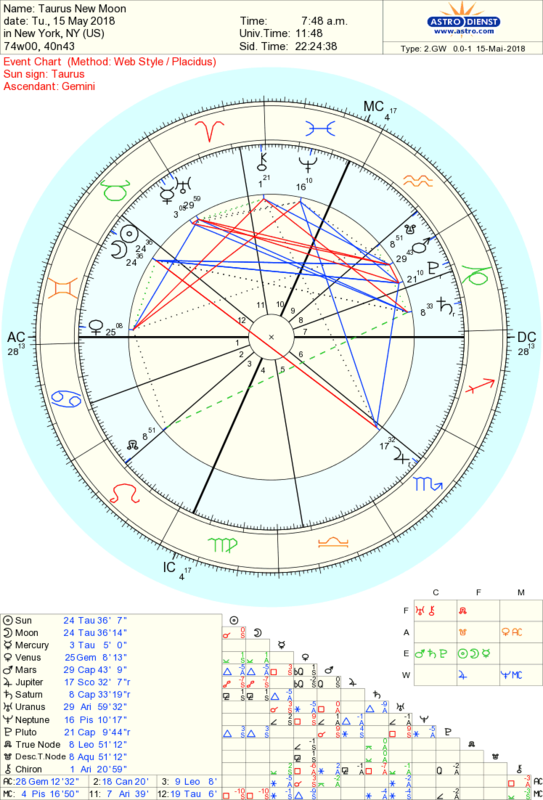 Which is to say that this new moon is woven with the energy of Uranus and Mars at the very end of their signs, getting ready to leave, but still very much connected to the energy of the past. There’s a weight to Mars and Uranus, a karmic weight as the planets hang at 29 degrees, and a restless anxiety that comes from their square aspect. Mars and Uranus are calling upon us to really consider the fruits of our labors and the effects of our actions, especially what’s unfolded in the eight years Uranus first arrived in Aries. When we delve deeper into the chart of the new moon, it’s pointing towards Venus in Gemini. Information, choices, ideas, education, and travel will factor prominently into this lunar month. There’s a push-pull between Taurus and Gemini. Taurus wants to take its time and the Gemini wants to move forward and manically try every direction. Plus, the new moon is opposite Jupiter and trine Mars and Pluto. We’re really looking to create something with this fertile soil of Taurus. Venus in Gemini is merely the pollinator. Putting this all together, the coming four weeks will be interesting to say the least. We have the tools and the drive to powerfully renew ourselves, to bloom and to blossom, but we’ll have to reconcile the past. Plus, with Uranus changing signs so soon after the new moon, and arriving in Taurus, this lunar month may launch us into very new territory. Creation isn’t easy. It’s a messy, confrontational, and violent affair. Think of the energy of volcanos and how the lava, once cooled, becomes rich earth for new life to take hold. Everything is waiting for you, but what has to change? What do you want to plant in the coming weeks? What do you want to bloom and flourish? Venus in Gemini gives us the ideas, but we need the hands in the earth practicality of Taurus to make it happen. And with Jupiter pulling on the energies of the new moon, think big and be bold. PS — If you want to learn more about Uranus in Taurus, I’m giving a webinar on Saturday, May 19. I’ll go through Uranus in Taurus for each sign plus what this new era means for us collectively. You’ll get to ask questions, too. Cost is $20 USD and comes with the recording, which is great if you can’t attend live. Details and registration here. Enjoyed this post? I also do private, one-on-one consultations via Skype, FaceTime, and phone, which allow us to delve into your chart and reveal where this new moon will manifest. Go to my consultations page to book your session. Check out my testimonials and FAQ to learn more about what I do.